Eye tracking technology enabled the research team at the University of Parma to assess infant macaques’ abilities at a much younger age, and in much more detail, than previously possible. Dr. Pier Ferrari is a neuroethologist at the University of Parma whose research focuses on social behavior in non-human primates and the underlying cognitive processes. Dr. Ferrari was the first to report that macaque mothers intimately communicate with their infants through mutual gaze and lip smacking gestures, and that some infants can reciprocate the gestures. 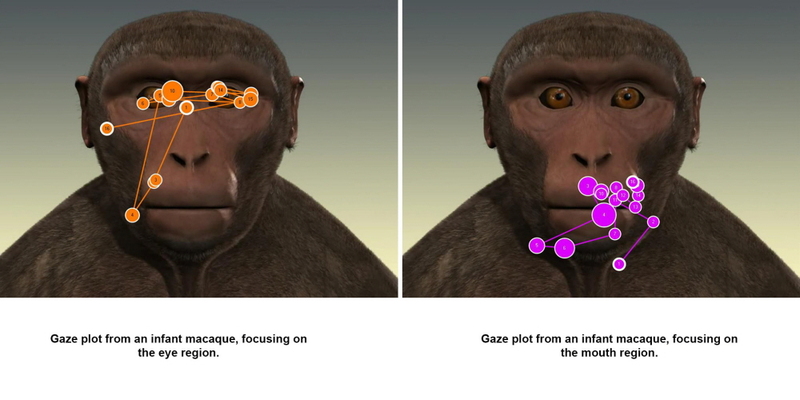 Dr. Ferrari uses the Tobii Pro T60 XL eye tracker to analyze infant macaque gaze at lip smacking gestures, and to discern the functional importance of gaze in those infants that do and do not imitate. The Tobii Pro T60 XL eye tracker proved to be easy to use, fast, and effective for data collection. For the first time, we were able to determine the exact focus of interest in these young macaques. In this study, the team of researchers was interested in how infant macaques understand and process social information, particularly how they visually process other macaques' lip smacking gestures. The eye tracker had to be non-invasive and be able to cope with the infants’ short attention span as well as the occasional head, or even body movements. It is challenging to obtain behavioral responses from infant macaques – they are limited in their coordination and movements, and commonly used methods to elicit responses (such as treats) are not very effective at this age. The team therefore decided to use eye gaze to discern how infants process neutral faces and lip smacking faces. Using the Tobii Pro T60 XL eye tracker, the team is now looking at how infant macaques understand their social environment, and how this understanding may change as infants mature into juveniles. 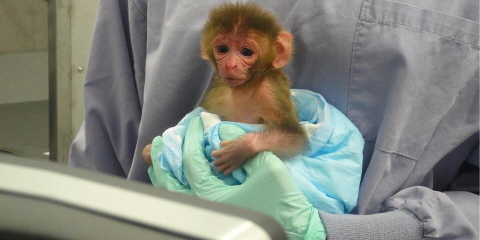 In this pilot study, 13 infant macaques between the ages of 10 to 30 days were tested five times a week. Using a Tobii Pro T60 XL eye tracker together with the Tobii Pro Studio software, a researcher held each infant in his arms in front of a video showing an animated, still monkey face, followed by an animated, lip smacking monkey face. 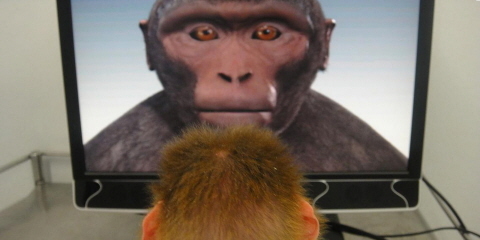 One of Tobii Pro Studio's 'attention getters' were displayed at the start of each test session to ensure that the monkeys were looking at the screen. Each video played for 40 seconds, and the monkeys were free to look as much or as little as they wanted. Using the statistics tools in Tobii Pro Studio, the researchers retrieved the total duration of looking time at each video, and then averaged the total looking time per infant. Researchers discovered that there is considerable variation in how individual infants process faces. For example, some infants focused strongly on the eye region whereas others focused strongly on the mouth region. The team is now analyzing whether these differences in looking behavior relate to observed differences in neonatal imitative abilities. Data from the study supports previous findings that infant macaques display sophisticated socio-cognitive abilities already at a very young age. Comparisons to similar experiments with human infants highlight the similarities and differences between our two species. Understanding how innate predispositions and early social experiences shape infants' understanding of their mothers' faces and others in general remain important issues to be explored in order to understand social processing abilities in humans and other primates.